The California Zero Textbook Cost(ZTC) Degree Initiative was launched through a Governor’s budget allocation in spring 2016 with the goal of reducing costs for community college students by implementing associate transfer degrees and career technical education certificates where all textbook costs have been eliminated through the adoption of alternative instructional materials and methodologies, including open educational resources (OER). Grants were awarded to 26 colleges to implement 36 ZTC degree pathways The following stories are from students who have been directly impacted by this program. After twenty-five years, Timothy Maldonado returned to school last year to better his job prospects. Now in his second year at West Hills College Lemoore (WHCL) in California, he is majoring in Sociology and is active in several clubs on campus to assist students struggling with food insecurity and disabilities. Tim understands the challenge of balancing college costs with family needs and has experienced firsthand the advantage of taking classes where the instructor has replaced expensive commercial textbooks with OER textbooks. Tim was one of eight students selected to join the recently launched OER Student Advocacy Network which aims to develop and empower current higher education students in California to become effective advocates for OER. The initial team is composed of students from California’s community colleges and state universities who have directly experienced the benefits of OER at their campus and have expressed an interest in advocacy to other colleges and universities. Tim first heard about OER in spring 2018 when his Sociology instructor, Dr. Vera Kennedy, was writing an OER textbook for their course. Dr. Kennedy explained to the students that they would not have to purchase an expensive textbook as she was in the process of writing their textbook. All of Tim’s sociology classes at WHCL have used OER. This has allowed him to download and build a digital library of open textbooks pertinent to his discipline of sociology. He plans to use this library for future reference as he continues his studies. The student network was launched last month at the Beyond Textbook Affordability Summit, co-sponsored by the California State University’s Affordable Learning Solutions and the Community College Chancellor Office’s Zero Textbook Cost Degree project. Under the leadership of Dr. Barbara Illowsky, De Anza College, and Dean James Glapa-Grossklag, College of the Canyons, a kick-off meeting was held and the students participated in a panel at the summit. Goals for the students include: developing a toolkit for student OER advocates, improving their ability to advocate for OER awareness on their own campuses, and enlisting other students and student governments to promote OER to faculty. In addition, the students will speak at academic conferences and submit articles to newspapers, with the aim of encouraging other institutions to engage their students in OER initiatives. This project will also empower students with coaching and mentoring on skills such as public speaking, writing formal resolutions, and developing promotional campaigns. Overall, this experience will engage and develop future leaders and place them firmly within the OER advocacy world. “As an instructor, I would believe that you would want to do everything possible to help students succeed in their educational dreams. If OER was available for you when you were beginning your degree would you have wanted … that opportunity? In addition to reducing costs, Tim has found that his instructors using OER are more specific about what he needs to read and understand in the textbook before taking a quiz or writing a paper. Previously, he might have read pages of information that were not pertinent to what he needs to learn but now he can zero in on key concepts. He can always go back and read the extra material after he has completed an assignment. Timothy Maldonado is majoring in Sociology at West Hills College Lemoore and plans to transfer to a California State University to complete his Bachelor’s degree. He hopes to use this degree to work in the community to improve the lives of those struggling with addiction and other difficult life situations. Dr. Vera Kennedy is a Sociology and Teacher Education professor at West Hills College Lemoore and an adjunct faculty at Fresno State University. She is a longtime adopter and advocate of open education and has authored two open textbooks. West Hills College Lemoore is a community college located in the heart of California’s Central Valley and is designated as a Hispanic-serving institution. Awarded both an OER Degree grant from Achieving the Dream and a California Zero Textbook Cost Degree grant, they also co-lead the Technical Assistance for the twenty-three community colleges in the California initiative. Michelson 20MM Foundation supports and invests in leading-edge entrepreneurs, technologies, and initiatives with the potential to transform learning and improve access to educational opportunities that lead to meaningful careers. Michelson 20MM was founded thanks to the generous support of renowned inventor and spinal surgeon Dr. Gary K. Michelson, and his wife, Alya Michelson. Learn more at www.20mm.org. OER Student Advocacy Network was launched in February 2019 under the leadership of Dr. Barbara Illowsky, De Anza College professor, and Dean James Glapa-Grossklag, College of the Canyons, with support from Michelson 20MM foundation. This project aims to develop and empower current higher education students in California to become effective advocates for OER through peer-to-peer mentoring in public speaking, writing formal resolutions, and developing promotional campaigns. Carlos and Edwin are the first students to be selected for the newly created paid OER internships funded by the Career Technical Education division of Grossmont College in El Cajon, California. They also work as peer advisors in the Career Center and at the High School Bridge Program held each summer to welcome new students to campus. They were chosen based on their demonstrated ability to work collaboratively with others on campus to improve student equity and achievement. Like many of their fellow students, both Carlos and Edwin have experienced the negative effects of expensive college textbooks. They began their OER internships in summer 2018, learning about OER through online and in-person interviews with experts and educators at their college and around the state. They have read articles on OER, met with faculty who have adopted OER, and reviewed videos about OER to gain a full understanding of the benefits and challenges for students and faculty. Carlos and Edwin also serve on the OER/ZTC (Zero Textbook Cost) Workgroup. This workgroup, composed of faculty, administrators, staff, and students meet monthly to advocate for OER and manage the development of their Zero Textbook Cost Degree initiative made possible through a grant from the California Community College Chancellor’s Office. Recently, they began working with a math instructor in the ZTC Workgroup to help foster more awareness about OER within the math department. This led to conversations with additional math instructors, but the instructors’ concerns about replacing the online homework system available through a commercial publisher remained a barrier to OER adoption. 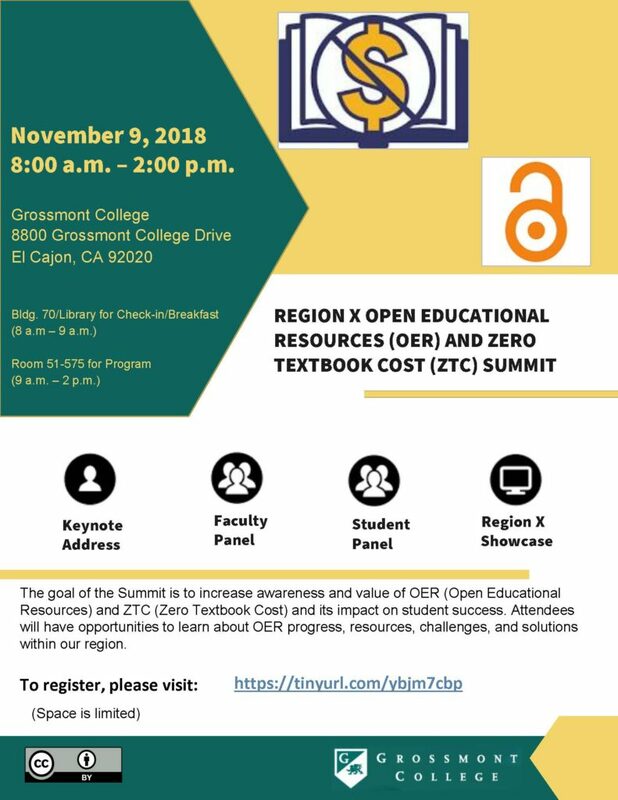 In November, the successful Region X OER Summit was held at Grossmont with Edwin and Carlos helping with the planning and execution of the all-day event. The summit featured a keynote with James Glapa-Grossklag, Dean at College of the Canyons and co-lead of the ZTC Degree Technical Assistance program; a student panel with them and Natalie Miller, a College of the Canyons’ graduate currently attending Cal Poly, San Luis Obispo; Delmar Larsen, Executive Director of Libretexts; a faculty panel; and OER adoption showcases from colleges around the region. Representatives from 10 colleges attended the event. One highlight was when math faculty from San Diego’s Miramar college shared information about how they had adopted OER and the open source MyOpenMath online homework system for their introductory courses. This presentation helped alleviate the concerns of the Grossmont math department instructors who now plan to adopt OER for all their introductory math courses over the coming year. 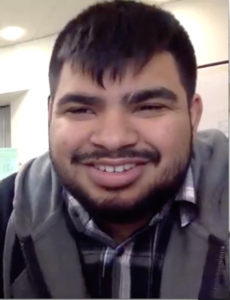 This spring semester, Carlos and Edwin will join the newly formed OER Student Advocates team, which will feature 8 students from California community colleges and state universities. The advocates will work with students from other colleges and universities throughout the state to advocate for OER and policies to reduce equity gaps. They will develop a toolkit to share information about open education and the most effective strategies to advocate for OER adoption to increase student learning and reduce equity gaps. Meanwhile back on campus, they are planning to heighten awareness of the cost of textbooks by inviting students to share how much they paid for textbooks during welcome week, highlighting OER classes where students don’t have to purchase materials. They also plan to run a “Thank You OER Faculty” campaign using poster boards to express gratitude to the teachers who have already adopted OER for their classes. These boards will include course numbers and section identifiers to help students find and enroll in these classes. They are already compiling a reader based on their OER research to pass on to Grossmont student interns who come after them. Carlos Espinoza, Vice-president of the Associated Student Government at Grossmont and president of the Interclub council helps coordinate efforts between clubs on campus including sharing important campus information such as open education opportunities. He has a double major in Criminal Justice and Sociology. 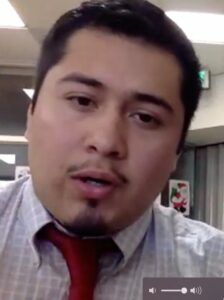 Edwin Hernandez, Student Trustee and member of the Associated Student Government has majors in Social and Behavioral Sciences at Grossmont and International Security and Conflict Resolution (ISCR), Justice Systems department, at San Diego State University where he is cross-enrolled. Grossmont Community College is a 2018 recipient of the California Community Colleges Zero Textbook Cost Degree Grant Initiative. Over the past year, they have developed two-year Geography and Sociology degree pathways, in which faculty have eliminated all textbook costs through the adoption and creation of OER and zero-cost materials. 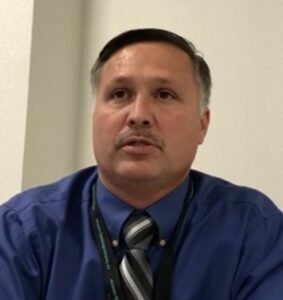 The OER Internship program was launched in August of 2018 by Dave Dillon, a professor and counselor at Grossmont College with support from Javier Ayala (Dean of CTE/Workforce Development) and Renee Nasori (Student Development Services Supervisor). It was conceived to give students a more active role in advocacy for open educational resources (OER) and practices at the college and statewide. Caroline is a full-time student at College of the Canyons with a double major in Water Systems Technology and Physics. The following is her story of perseverance over five years and how the Zero Textbook Cost (ZTC) degrees helped reduce her costs and streamline her pathway to graduation this spring. Starting college right out of high school, Caroline began as a part-time student while supporting herself. She felt isolated and was unaware of the different programs that provide financial and other assistance to students. Her studies were interrupted multiple times over the last five years as she and her family struggled to overcome financial challenges. The cost of school and textbooks were a real challenge for her; she recalls how one time she and three friends purchased an especially expensive textbook and attempted to share it over the semester. Due to her family’s financial problems, she was forced to drop out and work full-time to help support them. She saved enough money to return and because the Water Systems Technology major has become a Zero-Textbook-Cost pathway at College of the Canyons, it is making it possible for her to complete her studies without incurring additional textbook debt. The faculty in Water Systems Technology provide the open textbooks at no charge to students in a PDF format. In fact, her teacher emailed the textbook directly to students so no one had to wait. Caroline found it so much easier to learn because the faculty helped write the textbook and was able to explain everything clearly which isn’t always the case. Since Caroline has returned full-time to college, she now realizes how many faculty and staff at the college are dedicated to helping students succeed and really care. She didn’t realize this when she first started college and believes that many other students just like her are unaware as well. If more students realized all the supports available such as ZTC degree programs, it could really improve their ability to stay in school and complete their studies. Carolyn Trujillo, is a member of the Associated Student Government and has a double major in Water Systems Technology and Physics. She is transferring to California State University next fall to complete her bachelor’s degree in Physics. She plans to pursue a career in Water Management upon graduation. College of the Canyons is a 2017 and 2018 recipient of the California Community Colleges Zero Textbook Cost Degree Grant Initiative. They have developed a Water Systems Technology certificate and a Child Development degree in which faculty have eliminated all textbook costs through the adoption and creation of OER and zero-cost materials. The college is also a co-coordinator of the ZTC Degree Technical Assistance program which is lead by Dean James Glapa-Grossklag.